Two new facilities for tuneable-laser based satellite sensor calibration, one for cubesats and the other designed to be portable, cleanroom compatible (0.5-2%) and suitable for spectroscopic sensors. Detailed uncertainty analysis for EO sensors, providing pixel level uncertainty and covariance information from first-principles analysis. Methods for validating and comparing satellite level-1 products using ‘accessible’ and ‘remote’ reference test sites. Modelling site spectral BRDF properties, initiating community metrological radiative transfer code and providing recommendations to CEOS for international standardisation. Improve the traceability and further reduce the measurement uncertainties of atmospheric ECVs by interlocked and complementary means. Develop new reference instruments based on spatial heterodyne spectrometers (SHS) for the ground-based Network for the Detection of Mesospheric Change (NDMC). Develop a CubeSat based SHS and traceability concept to extend NDMC to global coverage. Verify new approach used for the non-uniformity correction of array detectors to IR hyperspectral imagers, potentially reducing the effect by an order of magnitude. Design and test prototype hyperspectral radiometer for System Vicarious Calibration (SVC) of Ocean colour (OC) sensors like OLCI (Sentinel 3) for lake, coastal and ocean applications. 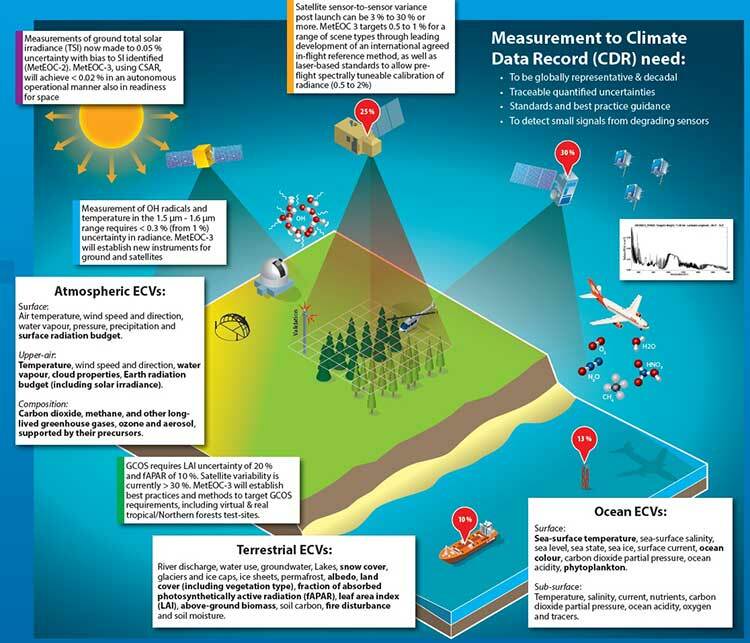 Establish traceability to World Infrared Standard Group (WISG) (sky radiance) of WMO BSRN network reducing uncertainty from 5 to 2 Wm-2.